Home » Myanmar: Is Co-existence possible? Myanmar is rich in many ways. It’s jade and gems, oil, natural gas and other mineral resources are relatively intact; it has its own ethnic identity, socio-cultural and traditional practices. In past timesMyanmar was invaded by Mongols, British Empire and Japanese empire back in eleventh century, nineteenth century, and twentieth century respectively; though the people of Myanmar tried to fought thembut could not win. It is still not easy to defeat an aggressor when it is technically and immorally powerful.During the Second World War Myanmar was invaded by Japan which made Myanmar a battlefield for British and Japanese forces. There are allegations that the father of Aung san suukyi was the main person who collaborate with the allied forced against the war with japan by creating an ‘anti-fascist organization”. Finally, after the Second World War, when the new polarization began, Myanmar got its independence in 1948 from the British Rule. But, as weseen in many cases of south East Asia, British planted some political mines in Myanmartoo for the future political interest and the capitalist benefits. One of them was ‘democracy’, which created social, cultural and ethnic divisions to declare its authenticity from 1948 till date. Another one is Mr. Sao ShweThaik, the first president of independent Myanmar, who was in British military service during World War I. Mr., Sao practiced and nurtured the western idea of democracy till his last day of presidency that ended in 1952. As a big bordering country, China has a long history of mutual beneficiary relationship with Myanmar. Before the Chinese revolution, the relationship between Myanmar and China was mainly trade oriented. Indeed, Myanmar was never been invaded by the Chinese power. On the other hand, China was the main importer of Myanmar’s jade, gems, timber and many natural goods. Since those countries have distinctive cultural similarities, a notable population of Myanmar started to follow Chinese Communism after the Chinese revolution.There was a communist upsurge visible in the west inflicted democratic era (1948-1962) before the Army took the power in 1962. After the military coup, the country’s image was politically and economically locked. But the greed of western capitalism and hegemonic geopolitics never takes break. The west with their Indian partners continued their support to their own factions of forces in Myanmar. They brought their old ally, Mr. Aung San. But this time it’s not him, his daughter Aung San SuuKyi to implement western policy of ‘democracy and freedom’ in the soil of Myanmar. On the other hand China could not continue their political support to their factions of forces in Myanmar, though the Chinese communist party and Burmese communist had political ties with each other. There were two reasons for Chinese interruption of political support to Myanmar communist parties; firstly China had to go through huge geopolitical compromises with the west for their own economic growth, and secondly the fall of Soviet Union in 90’s which made a huge negative impact on communist ideologiesincluding the one in Myanmar. China reduced their support to the Burmese communist party and started to build more effective relationship with the military government. 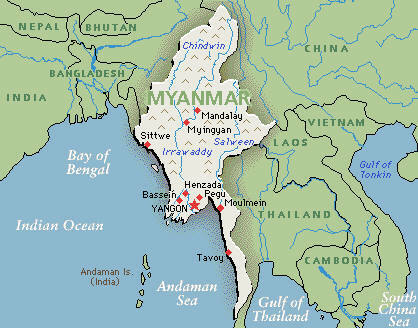 The west imposed many economic sanctions against Myanmar military government after the 1962 coup. But china was supporting the Military government by reliefs, trades and businesses. The west closed the door for Myanmar but their so called democratic injection in a little known society had been operational underground. To create an authenticity in the need for Democracy, there were many plots of terrorism, ethnic and religious violence occurred. The west has been engineering the violence on rohingyas and between other ethnic and political groupsto create social chaos in Myanmar. We saw, how the west capitalized that issue of chaos to create a global consent of need for democracy and justice in Myanmar.The westawardedAung san suukyi the Nobel Peace Prize to create another global appreciation of need for democracy in Myanmar. Now the West and their regional partners such as India want SuuKyi’s party to win the election so that they can show the world that the policy and the investments of the West in Myanmar are winning though they are being stamped out from Middle East. Although, China cannot directly interfere into the politics of Myanmar for some compromising reasons with the West, but indirectly their political presence can be seen in the conservativeness of the present Military state system of Myanmar. This general election process reserves 25% of total seats for the army personnel who cantake a direct part in law and decision making in upper and lower houses with the elected members. It seemed that, the people of Myanmar will not let the western democracy go unchecked and unchallenged. Even the electoral system declares that, Aung San suukyi is not eligible for presidency as she has a British husband and a British offspring. On a comment to the western journalists, SuuKyi said, “the election was fair but not free.” SuuKyi’s above statement hinted that she is not happy at all to form a cabinet with Military personnel who indirectly barred her from presidency; and at the same time, as her party thinks, backed by china. Although, AungSan SuuKyi visited Chinese president Xi Jinping in June, 2015; few months before the general election, some analysts suggested that China wants to create a joint platform with the west in Myanmar. So Suukyi’s visit to china has a symbolic importancefor a possible west-china co-existence in Myanmar politics. But from a geopolitical and geostrategic perspective, this co-existence will not last long, as we have already seen it in the Middle East. The world is changing; the other alternative blocs against the west are developing too. SCO, BRICS, BRICS Bank has started their operations. China is pumping up their military and other defensive installations for their BCIM project;a road to connect the China proposed One Belt One Road. Sitwee and some other places of Myanmar are very important for Military strategic positions of China. On the contrary, the west will try to establish NGO and other immoral programs in a so called democratic Myanmar to create more divisions, interest groups, oligarchy, chaos and instability in the countryto delay the BCIM project and complete ‘democratic’ occupation without sharing power with the military who already secured their 25% off-elected seats in the parliament. This 25% power share with the Military is a big deal for implementing western model of democracy andthe west knows very well that military should be uprooted from the state power to reduce the Chinese influence in Myanmar politics. Since Myanmar never won any battle against its aggressors, it lacks the zeal to fight any outer force. On the other hand, the people of Myanmar, without fighting the outer enemies, have been fighting within their own ethnic and social clans. Therefore, we can conclude that Myanmar, by swallowing a deep domestic political turmoil,was bound to take the risk to ride ‘two different boats of two different speeds’ at same time to the unknown sea of violence and instability. So, when SuuKyi says ‘the election was fair but not free’, she hints of a western promise to make Myanmar ‘free’ by neutralizing the army from the state power and that will create further chaos which may find rhythm with conflicts world politics.